Baking and history are two of my favorite things, so when I find a recipe with a great story behind it, I have to give it a try. 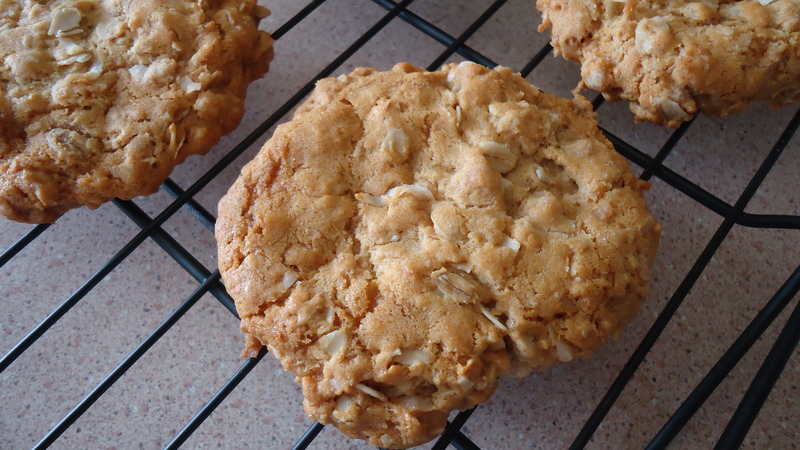 ANZAC biscuits originated in World War I, when the families of troops in the Australia and New Zealand Army Corps (ANZAC) needed a sturdy treat that could make a successful trip from the kitchens of Sydney or Wellington to the Mediterranean, where ANZAC troops were stationed. This is a hearty cookie, and the finished product is definitely one that could stand up to the tests of shipping halfway around the world. I like to imagine the delight of the men who received packages from home, with letters from their wives and tins of these cookies to give them a smile and the smallest sense of normalcy amid chaos. ANZAC biscuits are baked with Lyle’s Golden Syrup, which would have been a common pantry staple in the British Commonwealth during World War I. Scottish businessman Abram Lyle discovered that after sugar cane was refined it produced a syrup that could be further refined and used as a sweetener in cooking and baking. The syrup became wildly popular and by 1922 was even used by the British royal family. I bought my golden syrup at Soergel Orchards, but for those outside of the Pittsburgh area, it is also available online from King Arthur Flour. Line three baking sheets with foil or parchment paper. In a large mixing bowl, combine flour, oats, sugar, and coconut. In a small saucepan, melt butter and syrup together. Place baking soda in a small glass measuring cup and carefully add the boiling water, one tablespoon at a time; stir to combine. Add the baking soda water to the melted butter and syrup, stirring to combine. Add the butter mixture to the flour mixture and stir to combine; you may need to use your hands to fully incorporate the ingredients. Using a two-inch cookie scoop, drop dough onto baking sheets and flatten with your hand. Bake for about 15 minutes, until cookies are golden brown and firm, but not hard. Note: the dough begins to harden once the butter cools, so it is best to scoop and place on baking sheets immediately after mixing. What an interesting bit of history! looks tasty, too.